Halloween is this coming Monday - are you ready?! In recent years, Halloween has become more popular in Australia, with carving pumpkins stacked in big crates at the supermarket and costumes selling like hot cakes. 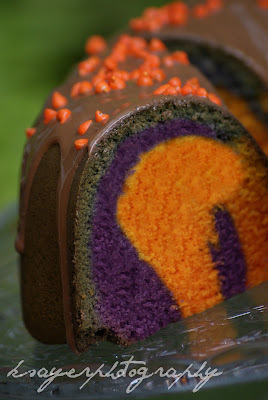 I decided to make a Halloween themed Bundt cake to kick off the holiday early. This cake is perfect for Halloween parties and is super simple! I mean, really, eating brains just isn't my thing - nor is spending the entire weekend slaving away in the kitchen over halloween themed treats. Plus if you get an invitation last minute, this cake is your best friend! Add in vanilla and eggs one at a time until combined. Add in flour and milk alternatively, with mixer on a low speed, until just combined. Separate half of mixture into a clean mixing bowl. Colour one batter bowl with purple food dye (or a combination of blue and red dyes) and the other with orange dye (or yellow and red) - the colours should be really bright as they will fade during cooking. Pour in 3/4 of the purple batter into the bundt tin, being sure to cover the entire base. 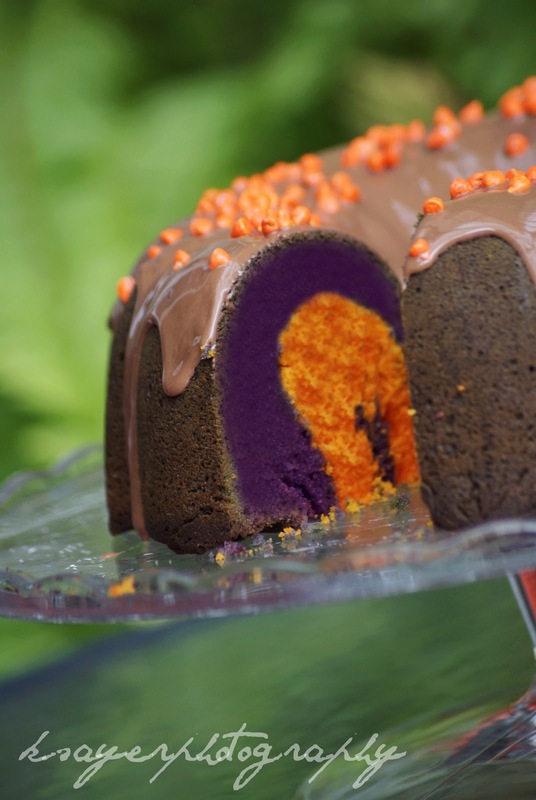 Gently pour the orange batter on top of the purple batter, towards the center, leaving about 1 cm of the purple batter on the edge. Pour in the remaining purple batter, trying to cover as much of the orange as possible. Place the filled bundt tin into the oven and bake for ~ 1 hour, until the tip of a knife or skewer inserted into center of cake comes out clean. Leave cake to cool before turning out and leaving to cool completely on a wire cooling rack. Melt chocolate and oil on a low heat until completely melted. You can do this on the stove (bain marie technique) or in the microwave - just be sure not to burn the chocolate! 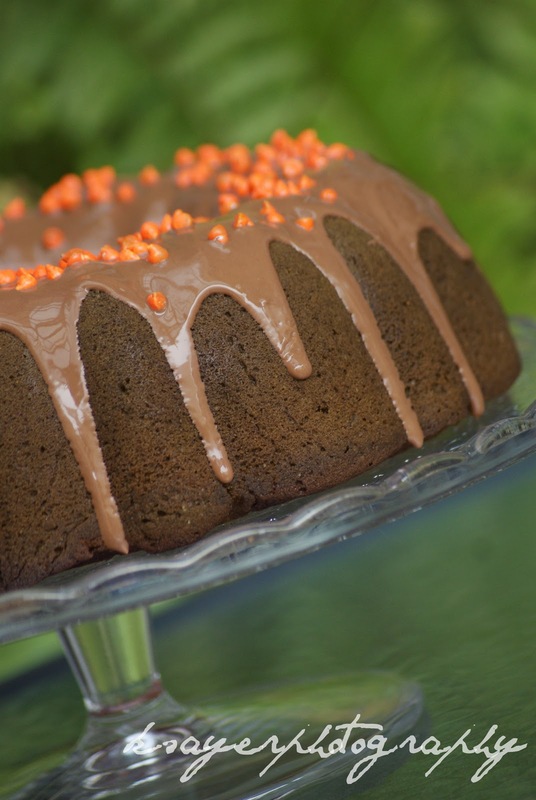 Place the cooling rack with the cooled cake ontop of a lined cookie sheet and pour the chocolate glaze on the top of the bundt cake, allowing the glaze to drip down the sides. and there you have it! easy as easier than pie! NO FREAKING WAY! this is crazy gorgeous. i can't even believe my eyes!! LOVE the colours in this cake :) I don't really celebrate halloween, but that's mostly because my friends never do so there's no one to celebrate with :( I love looking at all the halloween decorations at the shops now, and the halloween treats people make!